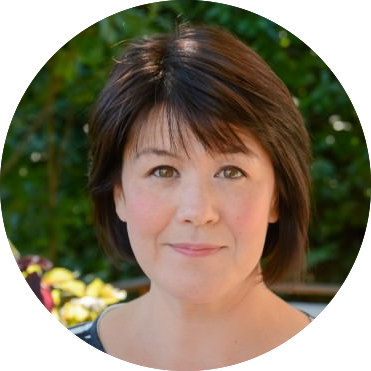 Cooking in the summer seems almost effortless. The farmers market is brimming with fragrant, perfectly ripened fruit just begging to be eaten. When you have such high quality ingredients you don’t need much to enhance them and cobblers are a great way to highlight seasonal fruit easily and without a lot of fuss. I’ve never been big on fruit desserts since my boys aren’t that into them. My husband has a rule that fruit and dessert are two things that should always be kept as far away from each other as possible. He is willing to eat fruit for breakfast but when it comes to dessert it’s chocolate, or forget it. 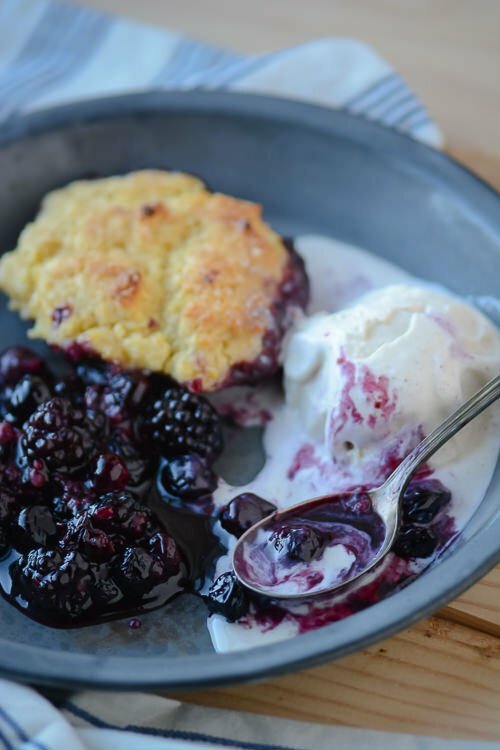 Last summer I started playing around with cobblers and crisps for a few parties that we had and I love to whip one up whenever we have guests. 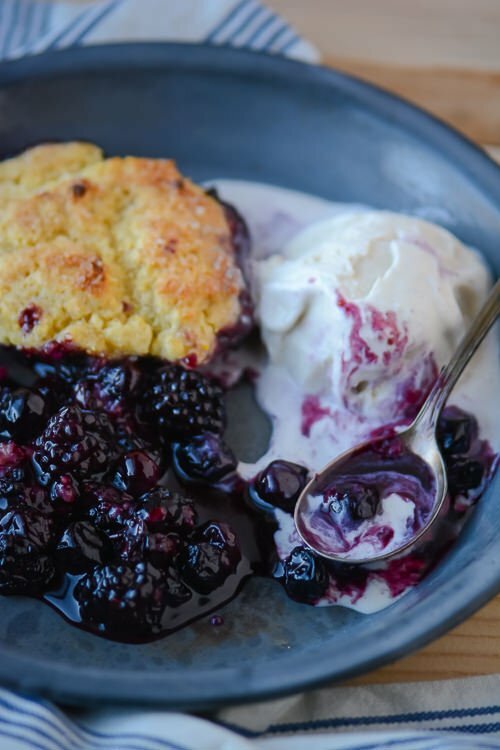 You can prepare the fruit ahead of time and the biscuit topping only takes about 5 minutes to prep so you can pop it in the oven while you serve dinner and you’ll be rewarded with a sweet, sticky utterly delicious dessert that just screams for a huge scoop of vanilla ice cream. Peaches, nectarines or plums would all make great additions or substitutions in this recipe and if you happen to find yourself with any leftovers it re-heats well. 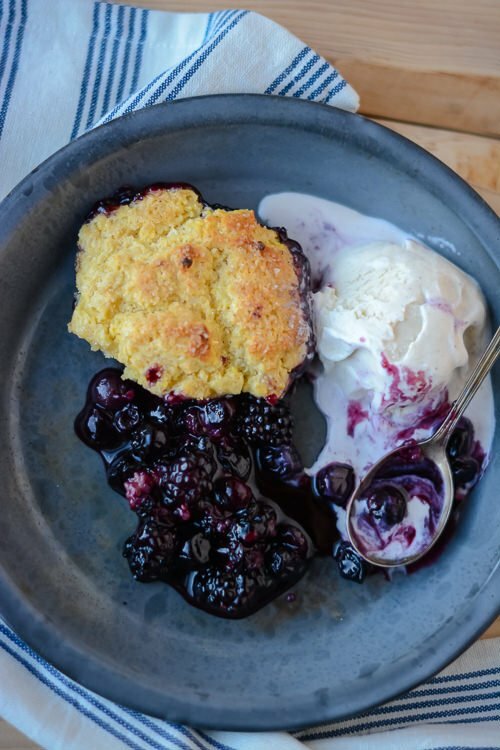 Packed full of juicy, sweet blackberries and blueberries and topped with a cornmeal biscuit dough this cobbler is the perfect addition to your summer barbecue! Butter a 2-quart ovenproof dish. Add the blackberries, blueberries, cornstarch, cinnamon, salt, sugar, lime juice and zest and toss to combine. Let stand while you prepare the biscuit dough. This can be done up to 2 hours ahead, just let the mixture rest in the fridge until you are ready to add the biscuit dough. In a bowl, sift together the flour, cornmeal, sugar, baking powder, and salt. Add the butter to the mixture and using your fingers break the butter into the mixture until you have pea-sized bits of butter mixed in with the flour. Gently mix in the buttermilk and mix with a spoon just until the dough comes together. Drop spoonfuls of the dough on top of the fruit mixture in a random pattern. It should be uneven and not cover the entire surface of the filling. Sprinkle the turbanido sugar over the top of the biscuits. Bake until the juices have thickened and the biscuit top is golden brown, 20 to 25 minutes. Let cool slightly. 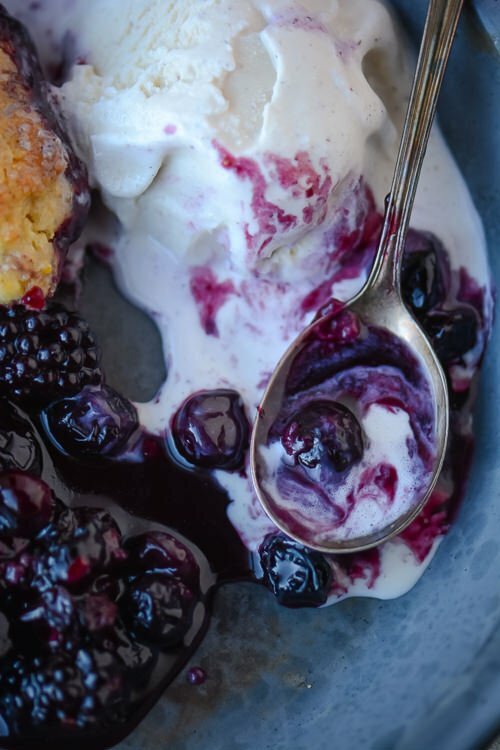 Scoop the cobbler into dishes and serve with vanilla ice cream while still warm. This looks delicious, I don’t know who could resist this. Fruit cobblers are one of my favorite desserts and I was planning on making one this weekend, in fact! I am fairly new to the world of cobblers but I have to say that I love how simple, versatile and delicious they are! This looks perfect! And my momma in Indiana makes a cornmeal cobbler. I can’t wait to try this recipe! I am a sucker for anything with cornmeal. One of my very first recipes I ever posted was for a cornmeal pancake. I hope you like it if you try it!